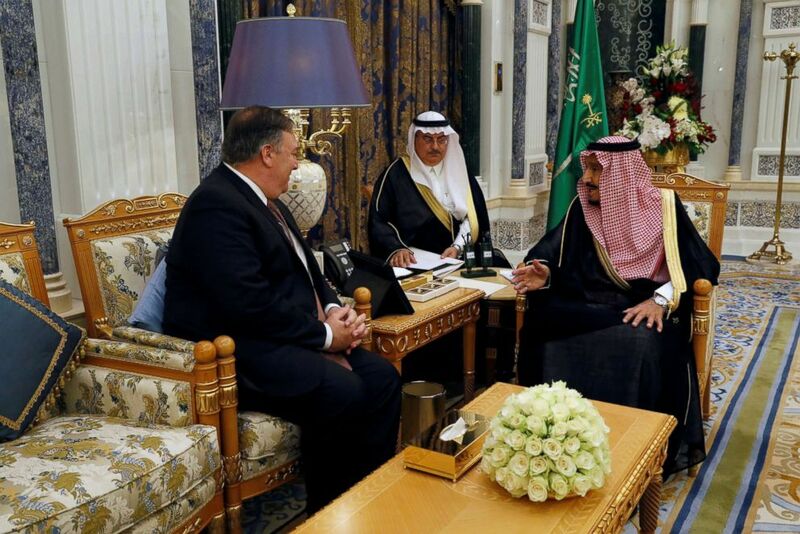 Secretary of State Mike Pompeo met with Saudi leaders to press for answers. Saudi Arabia's young crown prince is again denying any involvement in the disappearance of Washington Post columnist Jamal Khashoggi, according to President Donald Trump, who tweeted that he spoke with him and Secretary of State Mike Pompeo Tuesday after dispatching the top U.S. diplomat to the region amid international outrage over Khashoggi's possible death. "Answers will be forthcoming shortly," Trump added. In photo-ops with King Salman and Crown Prince Mohammed bin Salman, Pompeo greeted them warmly, even as the Saudis weigh whether to accept culpability for Khashoggi's death, a source with knowledge of their discussions told ABC News. It was unclear what explanation they would give or when that statement would come. Turkey has said they believe Khashoggi was killed in the Saudi consulate in Istanbul. (Leah Millis/Pool via Reuters) Saudi Arabia's King Salman bin Abdulaziz Al Saud meets with Secretary of State Mike Pompeo in Riyadh, Saudi Arabia, Oct. 16, 2018. The Saudis have fiercely denied that charge, with the Trump administration urging caution until an investigation can take place. But while the Saudis said Khashoggi left the consulate and disappeared later, there's no evidence that he ever exited the compound after entering 14 days ago. After "direct and candid" meetings with Saudi leaders, Pompeo said he believed they had a "serious commitment to determine all the facts and ensure accountability, including accountability for Saudi Arabia's senior leaders or senior officials." The U.S. would await a "full and complete conclusion with full transparency" from the Saudi public prosecutor, he said in a statement. But Trump seemed to already have an answer he approved, tweeting that with Pompeo joining him on the phone, Crown Prince Mohammed bin Salman "totally denied any knowledge of what took place in their Turkish Consulate... He has already started, and will rapidly expand, a full and complete investigation into this matter." On Monday, he said "rogue killers" could be responsible, even though there has been no confirmation yet that Khashoggi is dead. Pompeo raising the possibility of "accountability" for senior Saudi officials was a notable departure after his seemingly warm meetings during the day. But critics were quick to point out that the Saudi track record on investigations is poor, with the public prosecutor known more recently for arresting women's rights activists, detaining Saudi princes at the Ritz Carlton and demanded payments, and warning Saudi citizens against "sharing or spreading rumors or fake news" on Saturday. Pompeo will head to Turkey's capital Ankara on Wednesday to discuss Khashoggi's case with Turkish Foreign Minister Mevlüt Çavusoglu and others. 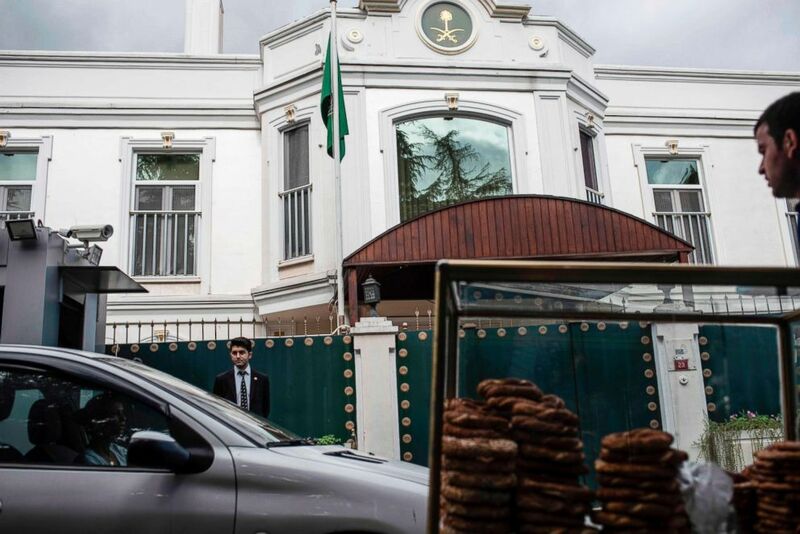 Officials there have at times had to skirmish with the Saudis over their investigation, first waiting nearly two weeks to be given access to the consulate and on Tuesday being denied entry to the top Saudi diplomat's residence in Istanbul. Turkish President Recep Tayyip Erdogan suggested Tuesday that the consulate may have been recently painted, too -- one day after a cleaning crew was seen entering hours before Turkish police. In his first meeting Tuesday with King Salman, Pompeo had words of thanks for Saudi's "strong partnership" and "his commitment to supporting a thorough, transparent, and timely investigation," State Department spokesperson Heather Nauert said. The importance of that investigation was something Pompeo and Crown Prince Mohammed bin Salman also agreed on, Nauert said. 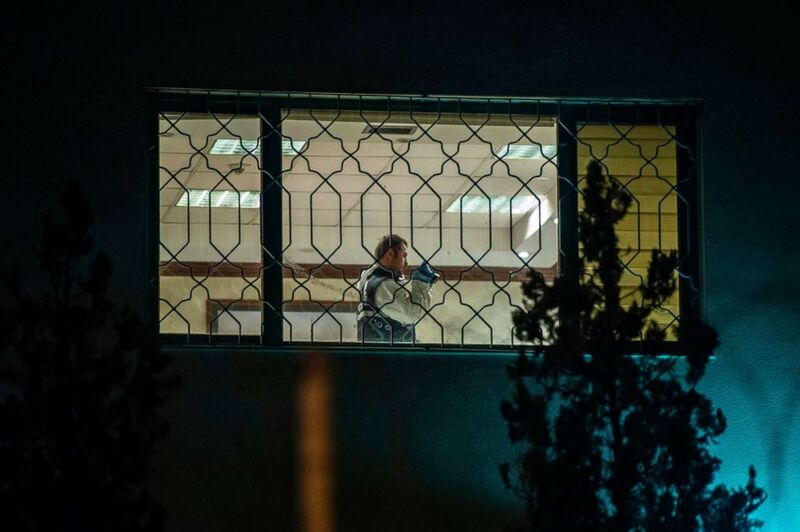 (Bulent Kilic/AFP/Getty Images) A Turkish forensic police officer works in Saudi Arabia's consulate in Istanbul on Oct. 15, 2018 during the investigation over missing Saudi journalist Jamal Khashoggi. But it's the crown prince or "MBS," as he is sometimes known, that members of Congress and other U.S. officials worry ordered the plot against Khashoggi. Painted as a bright, young reformer who has opened up Saudi Arabia to movie theaters, sporting events, and women driving, the crown prince has also overseen a crackdown on political opposition, including by arresting several wealthy Saudi princes, and activists, including women's rights advocates. 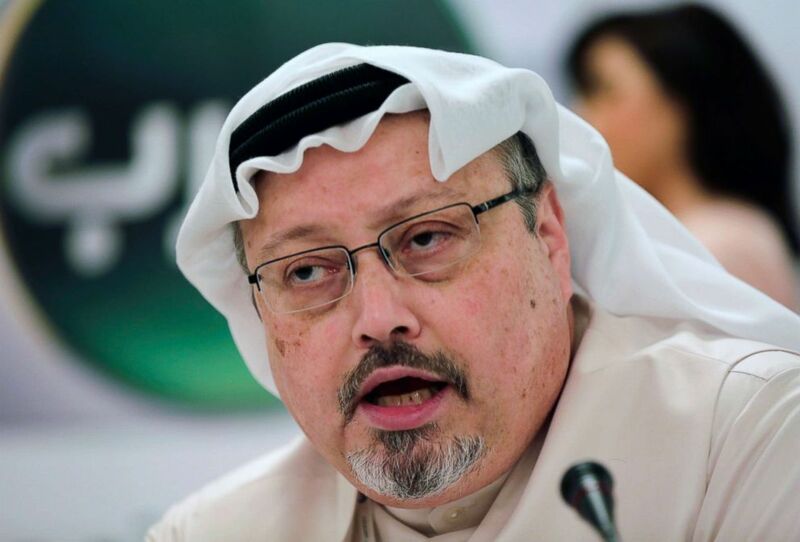 Media reporting of his alleged involvement in Khashoggi's disappearance and possible death has strengthened that darker image of a ruthless young leader. "I'm not going back to Saudi Arabia as long as this guy's in charge," said Republican Sen. Lindsey Graham of South Carolina, a staunch supporter of U.S.-Saudi relations and close ally of Trump's. "This guy is a wrecking ball. He had this guy murdered in a consulate in Turkey, and to expect me to ignore it – I feel used and abused." "I'm going to sanction the hell out of Saudi Arabia. You know, we deal with bad people all the time, but this is in our face. I feel personally offended. They have nothing but contempt for us," Graham told Fox News Tuesday, adding the crown prince "has got to go." (Hasan Jamali, File/AP, FILE) Saudi journalist Jamal Khashoggi in Manama, Bahrain, Feb. 1, 2015. Turkey claims that Khashoggi, who wrote for The Washington Post, was killed inside a Saudi diplomatic mission in Turkey. The tone from Pompeo's trip was noticeably different. He smiled and shook hands with King Salman and the crown prince, with whom he joked about jetlag. "We are really strong and old allies, so we face our challenges together -- the past, the day of, tomorrow," MBS told Pompeo, who nodded along and responded, "Absolutely." Pompeo's meetings during the day all lasted around 30 minutes, but in the evening he'll have dinner with the crown prince, which is expected to be a longer affair. 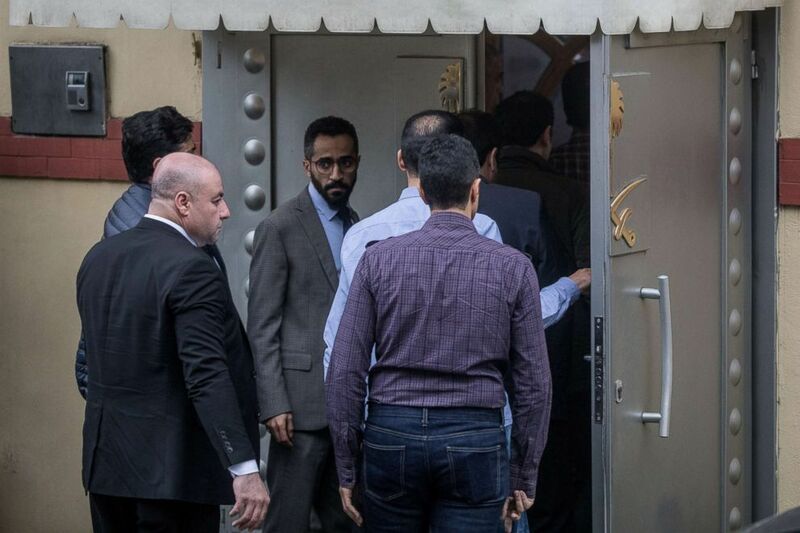 (Chris McGrath/Getty Images) Saudi investigators arrive ahead of Turkish police at the Saudi Arabian consulate on Oct. 15, 2018 in Istanbul. Ahead of Pompeo's visit to Ankara, the U.S. had welcomed Turkey and Saudi Arabia announcing a "joint inspection" of the consulate, and the first Turkish police officials were able to enter the compound Monday. (Yasin Akgul/AFP/Getty Images) A food vendor pushes his cart past the residence of Saudi Arabia's Consul General Mohammad al-Otaibi in Istanbul on Oct. 16, 2018.